iVolution is easy to pick up but hard to put down. You start with a 2 letter word seed like “AN” and use it to build a word like “FANTASTIC.” Then you select 2 letters from your word, and those letters become the next word seed for your opponent. The words keep evolving, back and forth, a piece of your word becoming part of your opponent’s word, then a piece of their word becoming part of your next word. 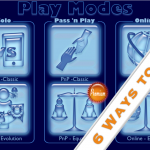 iVolution is incredibly simple yet incredibly addicting. So what are you waiting for? It’s time to join the revolution in word evolution! We really hope you enjoy our new game. We’d love to hear from you. So please don’t hesitate to contact us. Please advise. I volition on my mini-iPad won’t define wods like this game does on my iPhone. -……please tell me know how this can be fixed…. I really like the feature. Thanks…. 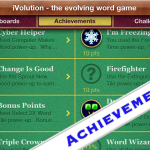 1) Press the dictionary button in iVolution. 2) Tap the blue word “Manage” on the lower left of the pop up screen. 3) Download either (or both) the “New Oxford American Dictionary” or “Oxford Dictionary of English” by tapping on the Cloud icon to the right of option. For some unknown reason, the “Apple Dictionary” does NOT work! 4) After the dictionary downloads, tap the blue arrow “<” on the top left of the screen. 5) Tap the word “Done” on the top right of the screen. The next time you use the dictionary button, you will now see a definition. I don’t know why Apple has made this so complicated in iOS 7. Please let me know if you have any more trouble with this. The app is for ipad..
What happens when you try to open the game? Judging by the dates on the comments here, this might prove futile, but I must try. I’ve been getting warnings about iVolution needing an update for a while now. Last night I got one that said it will not work with iOS 11 at all. Are you guys still around? Is there anything we can do to update this app? I’d truly be sad to lose it. I have three go to apps in my arsenal, and iVolution is my favorite one of those. Please please help! Please provide upgrade for iVolution! Can’t play with iOS 11! Don’t understand your comment. Is iVolution no longer available or is upgrade in the works? What does awaiting moderation mean? Are you going to update this app for iOS 11? Is iVolution playable anywhere? I miss it on iPhone. Hello. Could you update the iVolution game to iOS 11 or later. I miss playing this game SO MUCH!